The topic of Honduras moving its embassy to Jerusalem was previously discussed between Netanyahu and Hernandez during their mutual visit to Brazil in January. Honduras joins multiple other Latin American countries to make the move. Last year, the US formally moved its embassy to Jerusalem, and since their announcement the international dominoes have fallen despite opposition at the United Nations. 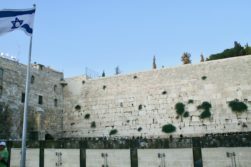 In addition to those countries who have already moved their embassy, others such as the Czech Republic, Brazil and Australia have either started in that direction, discussed moving their embassies, or are opening new diplomatic offices in Jerusalem. Dăncilă referenced the decision by President Donald Trump to place the US Embassy in Jerusalem last year, calling it an “admirable and courageous step”, according to a translation of her speech by Google Translate. She said the American decision not only “impressed” her, but her government and the people of Romania as well.